God, in His marvelous grace, wisdom, and provision, has planted things in our church culture, in our intrinsic culture, that could be easy to overlook. People serving in many areas seek to honor God and others in all they do. They have a spirit of excellence in their lives which motivates them to go above and beyond the status quo. This opens their lives for the blessing of His favor. American culture tends to view excellence in churches as a negative because we get excellence and perfectionism confused. Excellence has nothing to do with perfectionism. Listen to learn more. As a local church, our mission and purpose can be summarized in three statements: Loving God, Loving People, and Loving Life. Loving Life is about experiencing the abundant life promised in John 10:10. Today's culture defines the abundant life in terms of financial prosperity, faster cars, bigger houses, smart kids, and so forth. To understand what abundant life is really about for the Christian, it is important to understand what the Bible has to say about it. Listen to learn more. Last week, Pastor Dennis explained that as a local church, our mission and purpose can be summarized in three statements: Loving God, Loving People, and Loving Life. In 1 Corinthians 11, Paul talks about communion. When we are together and receive communion, we are both the Bride of Christ, representing a close loving relationship with God, and the Body of Christ, representing a close loving relationship with one another. Communion is about being together and thanking God for what Jesus did. The traditional marriage vows can teach us more about what communion and togetherness is all about. Listen to learn more. As a local church, our mission and purpose can be summarized as: Loving God, Loving People, and Loving Life. Sometimes things get a bit confusing because words can get used a lot and begin to lose their meaning. Love is one of those words. The Bible says God is love, but the world says the opposite; it says love is god. Biblical love is defined by the very virtue and nature of who God is. Listen to learn more. We, as Christian Life Church, believe Christianity is a series of next steps. Without a series of next steps, the journey can easily overwhelm us. God is the only One who can determine each person's next step, and further, we will all share three specific next steps. Listen to learn more. Part of our DNA as a local church is that we believe every member is a minister. Membership at Christian Life is based on coming to church services, and then to keep on coming; there is no membership roster. We also believe every person has a ministry calling from God that only they can fulfill. Our calling is given by God the moment we accept Jesus as our Lord and Saviour. Listen to learn more. We are a church that embraces the reality that we get to, not that we have to. In Jesus, we exchange our own merit and standing for His merit and standing before God. In Jesus, our spiritual nature changes and our have to dies. We believe it is an honor and privilege to worship God, and to follow His ways; not because we have to, but because we get to. Listen to learn more. 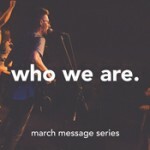 Near the beginning of each year, we like to review who we, as Christian Life Church, are. This first message of the series takes a look at how we seek to be a church of balance in four key areas, as represented by the four ends of the Cross. The vertical bar represents a balance between the Holy Spirit at the top and the Truth of the Bible at the bottom. The horizontal bar represents a balance between the needs of the lost and dying world on one side, and the needs of our local church members on the other. Listen to learn how we, as a Christian, can live a balanced life.